A very Happy Friday my dear friends! Today's my birthday, my last year in my 20s (#29onthe29th), which I still can't believe, since it feels just like yesterday I graduated college and just like last week was the last day of high school; it's crazy how fast time goes by! It's been one rollercoaster of a year; we moved, I got pregnant, and had Aviah. I feel incredibly blessed and grateful. As for birthday plans, there's nothing really on the agenda other than celebrating with something small at my house and what I really want most is a nice long nap, lol. Seriously though. On Monday, I talked about the utility jacket, but a denim jacket is just as versatile, if not more because it's denim and works with anything as a pair of jeans would. Just as you would add a dresser black blouse with a pair of jeans for a combination that's both dressed up, yet casual, you can do the same with a denim jacket and basic LBD. Also, a light weight scarf is also a perfect addition for more added warmth in the mornings and can be used as a wrap or even a poncho, if you were to wear a waist belt, if it begins to heat up more throughout the day and the denim is too heavy. You know my love for fall runs deep, it's one of my favorite seasons. You also know that I have an obsession with outerwear and one of the perfect jackets for the season is a utility jacket. They usually go with any casual outfit, since they're often in an earthy natural color, like olive or military green, similar to mine. The one I'm wearing has leather contrasts on the sleeve, for an edgier take, but you can of course opt for styles that don't have it. I actually love this camo one, especially since camo is trending huge this fall season, which we talked about in this post. You know the saying, "no white after Labor Day?" Well, we've come a long way since then and as I'm sure you've noticed, most people don't pay mind to this "rule" anymore and rightfully so because it's such a great neutral and alternative for your classic denim when you want to switch things up a bit, add a refreshing touch to your outfit, as well as enhance those beautifully saturated fall-time colors we all begin wearing this time of year; this is why I love it so much. Happy Thursday and happy first day of fall, my dear friends! Fall is one of my favorite seasons, so I'm very excited that it's officially begun and I will no longer get the side eye for talking about it, haha. 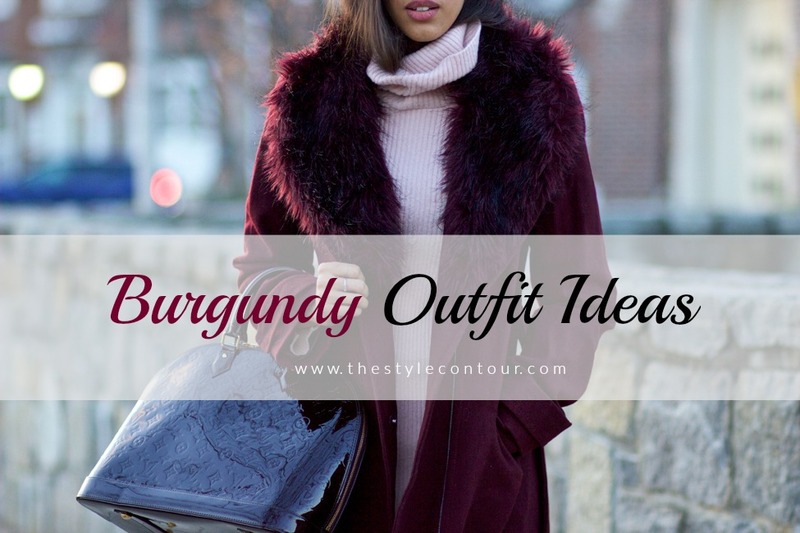 Today, I'm sharing a variety of ways you can create fall-ready outfits, from the archives, centered around one particular color that exudes the season, burgundy; let's get started! Today's outfit is one that's fairly simple, yet still looks polished despite the inclusion of distressed denim shorts. What makes this outfit appear a bit dressy is the black flowy tunic and the addition of gold accessories. There's something about black and gold that reads sophisticated and chic, wouldn't you agree?! Just add some gold jewelry to your black piece, be it a LBD, LBJ, or top and you'll see what I mean, if you're not already convinced. How was your weekend? I hope it was fun and/or relaxing! As we begin to near the start of fall (which is this week!) I'm paying tribute to two of the most popular trends of the summer season, banker stripes and gingham, by combining them into one outfit. I never thought to combined these two prints, until I saw my ultimate muse, Olivia Palermo, do it and so, you know I had to follow her lead! She added a statement purse to her look, I decided to add a statement shoe in a rich magenta shade, which I felt worked really well with the blue in the shirt. 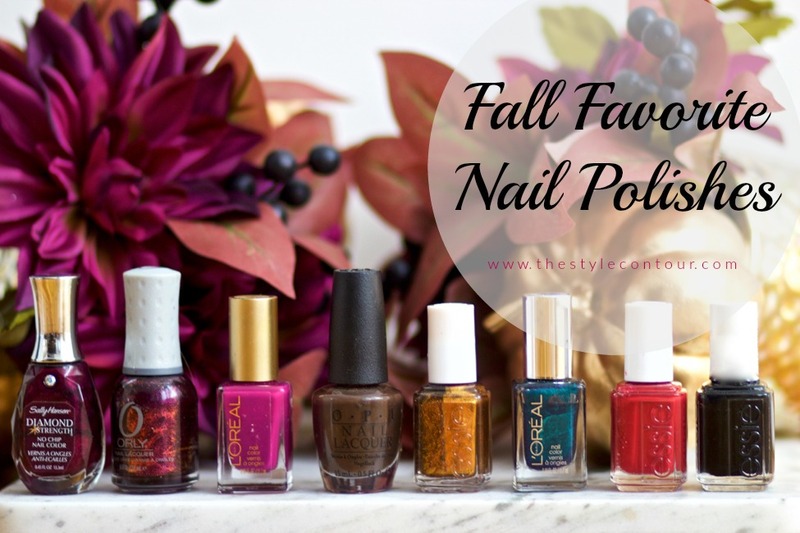 Last spring, I shared some of my favorite seasonal nail polishes with you, so I thought it'd be fun to share some of my fall favorites! I try my best to have my nails done because they make all the difference in my mood and self-esteem believe it or not! 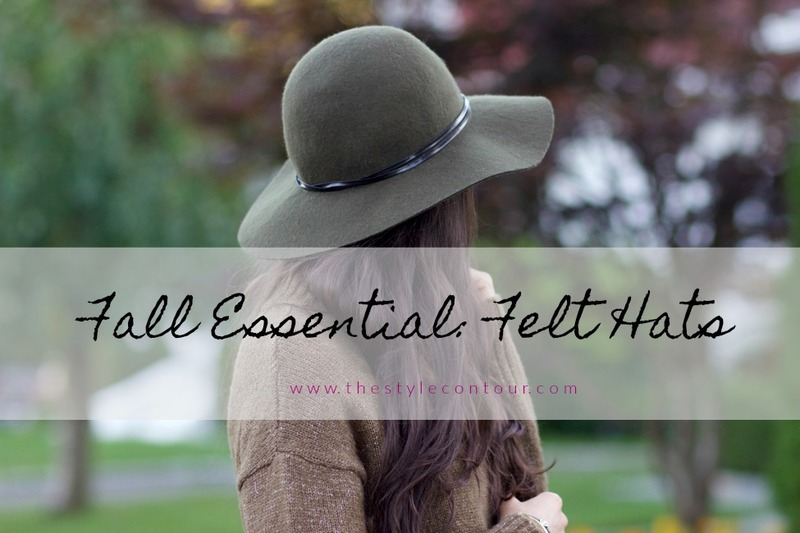 I feel more put together when they're done and I love exploring different color options that are practical to wear with much of my wardrobe for the week (I try to do them weekly) and that also serve as a statement, specifically during the summer and fall seasons when colors are most often embraced.